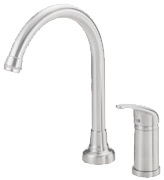 An Affordable Kitchen Faucet That Looks Anything But! I know my website may not be the first you’ve visited in your quest for a new kitchen faucet, and I feel your pain. I have spent many months drawing upon my own personal experiences as well as doing a great deal of research so I can bring you a selection of what I happen to think are the best faucets on the market. I have done my best to give you some good, honest reviews on the models I have come across, and for this one I’m going to tell you all about the Delta 4453-SS-DST, which is a single handle faucet with separate spray. Design is something that has become hugely important to anyone looking for a new faucet in their kitchen (or any other room for that matter). One reason for this is manufacturers offer more choices these days and people are more aware that, as functional as a faucet might be, it can add a certain sense of style to your décor. This model has been aptly named the Linden because the overall shape isn’t unlike that of the Linden Tree. 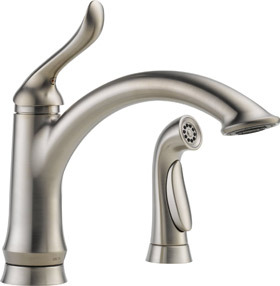 In fact, I think it’s one of the nicest looking faucets on the market. When you take a step back, it really does look like it has branches reaching for the sun! On top of that you get to choose which color you would like and this model comes in chrome, stainless and bronze. The main faucet has a single lever so you can control both temperature and flow with one hand, and the matching spray has been cleverly designed with comfort in mind. All you need to do when activating it is to gently squeeze whilst holding it in your hand. The sprayer is also wider than most other models on the market which means it’s far easier to use when you’re filling pots and pans without getting too much in the way of splash-back. It’s also perfect for washing produce and makes cleaning your sink a breeze! One of the best features I like about Delta and their faucets is the use of DiamondTM Seal technology. What many of us forget is how “healthy” a faucet is on the inside, yet this is one of the biggest reasons they fail. Delta has thought about this and included an internal surface which is made up of tiny diamonds. What this does is ensures you get no leaks, and since diamonds are the hardest substance on earth, you won’t find a faucet that’s more durable from the inside. It also stops the water from coming into contact with potential contaminants that may be present with other surfaces. Another piece of technology I really love is the brilliance finish. How this works I couldn’t begin to tell you, but this faucet is resistant to abrasions or scratches that can occur with traditional chrome or brass. When you’re ready to install this kitchen faucet, the manufacturer does recommend you use a plumber (and I do as well as it happens). The reason for this is some people have mentioned problems with temperature control or even dripping, so to avoid this just use a professional to install for you. You will get a 10 ½ inch escutcheon included with the price so that’s one less headache to worry about, and Delta offers a comprehensive warranty. The last point I would like to make here is the dimensions. Some have noted this faucet is a little on the short side for their needs so ensure you check these out before making a purchase. If you’re interested in finding out more, you can take a look at Amazon which mentions technical aspects like size and the last time I visited their site, there were some deals on price that will knock your socks off.